Dimension: 9.4"L x 1.4"W x 6.7"H; Fit for most of basic electronic accessories. Well-organized- 7 Slip-resistant elastic loops for various cables, chargers, mouse etc. 1 iPad pocket with well padded to protect your 7.9’’ iPad Mini. 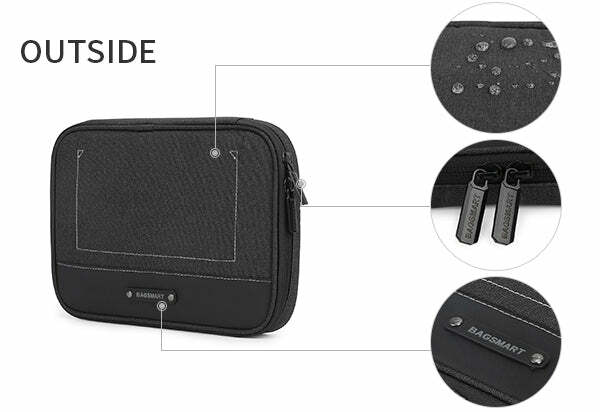 Well padded covers offer full protection for your electronic accessories.Two-way zipper closure for quick access and make pick-and-place in orderly. Why Choose BAGSMART Travel Electronic Organizer? Store your items organized without searching all over the place. Protect your electronic accessories from scratches, dust and accidental dropping. Keep your cables tangle free, no more mess, save your time and free yourselves. External Dimension (L x H x W): (14 x 10.4 x 1.4)"
Smart size cable organizer makes the the most efficient use of packing space inside your suitcase or backpack.Well padded compartment offers excellent protection for your accessories. Double zipper opening for easy and immediate access. Multiple pockets can storage more electronic accessories and keep them neat.